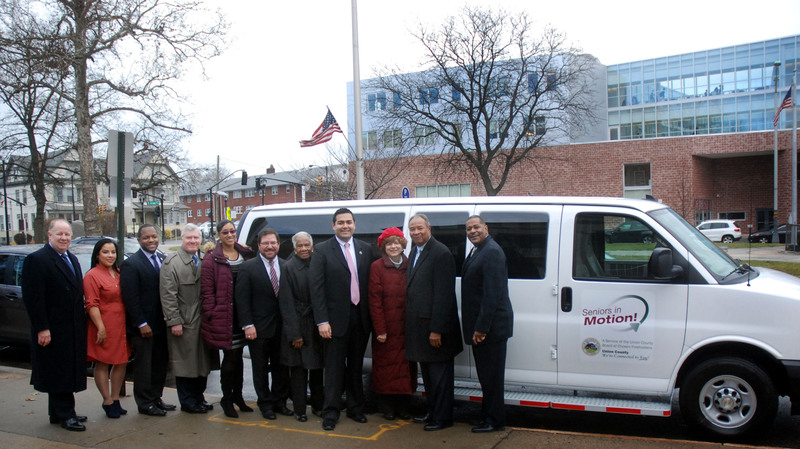 The Union County Board of Chosen Freeholders presented the City of Elizabeth with a new, 15-passenger van that will provide free transport for seniors citizens. The vans are being awarded to a total of 18 municipalities this year through Freeholder Chairman Bruce Bergen’s “Seniors in Motion” initiative to assist seniors with free, local transport. to R. Elizabeth Mayor J. Christian Bollwage, Jessica Martinez of the Elizabeth’s Senior Citizen Activities Division, Elizabeth Board of Education President Stan Neron, Union County Manager Alfred J. Faella, Elizabeth Health and Human Services Director Krishna Garlic, Elizabeth Councilman Manny Grova, Union County Freeholder Vernell Wright, Union County Freeholder Vice Chairman Sergio Granados, Union County Freeholder Bette Jane Kowalski, Elizabeth Fifth Ward Councilman Bill Gallman, and Alonzo Jones of the Elizabeth Office on Aging.